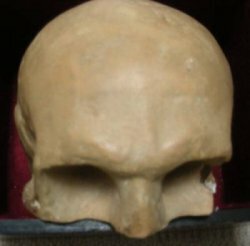 The plaster cast of Burns' skull. The inscription on the box reads "Cast of the skull of the poet Burns. 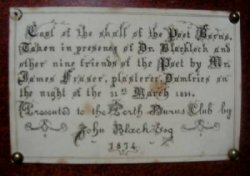 Taken in presence of Dr Blacklock and other nine friends of the poet by Mr James Fraser, plasterer, Dumfries on the night of the 31st March 1834. Presented to the Perth Burns Club by John Black Esq 1874. In 1873, the members of Perth Burns Club had to make an important decision. They required a box to store the club's property, but the one they had in mind was to cost £1 and that was all the money the club had in the bank. After some debate, the box was purchased and the members had a whip-round to pay for a brass plate which was suitably inscribed and screwed on top of the lid. It was the discovery of this box in a storeroom of the Station Hotel in 1977 that led to the reformation of the present club following its abeyance since the outbreak of the Second World War. 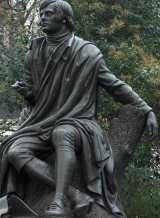 The contents of the box included a carved wooden statue of Robert Burns made in 1873 and a plaster cast of his skull taken at the exhumation of the Bard's body in Dumfries on March 31, 1834 and presented to the club in 1874. The Perth Burns Club was instituted on February 8th, 1873 at a meeting in the Stormont Arms Hotel when Thomas B. Nicoll, a local stationer, was elected as the first president. Basically an all-male literary society, the club met on the first Saturday evening of each month with additional whist parties held on Wednesday evenings. All candidates for admission had to be vouched for as having "a taste for Scottish or general poetry and literature." No political or religious discussions were allowed, nor was any member allowed to give "any objectional song, toast or sentiment, or otherwise say or sing whatever may be deemed by the members present, or the chairman, out of place." From that small beginning, Perth Burns Club continued to grow with the result that a second city club, the St. Johnstone Burns Club, was formed in 1892. A third club, St. Mark's Burns Club, was formed in 1924. It is believed that the idea of a Burns Federation partly originated in Perth and when the Federation was eventually formed in 1885, Perth Burns Club was given the number 26 which it still proudly holds. In July 1885, club members Dr McKay, Mr Colin Rae Brown, Mr Reid and Mr Archibald Douglas, were in London at the unveiling on the Thames Embankment of the Burns statue which was presented to the nation by John Gordon Crawford and the club was represented at Kilmarnock in 1886 when the centenary edition of the Kilmarnock poems was published. It is reported that when members of the Perth club were present at the unveiling of the Burns monument in Albert Square, Dundee in 1880, they wore "full dress, white tie and gloves, with a spring of white heather in their buttonholes". Among the early presidents (1893-95) was William Whitelaw M.P. of Huntingtower Park, grandfather of the former Deputy Prime Minister, Lord Whitelaw. The club claimed to be pioneers of cheap day excursions when, in March 1879, they sponsored a day trip to Ayr. Four hundred travelled from Perth, dined at Goudie's Restaurant and visited Burns Cottage. Perth Burns Club went into abeyance for the first time prior to the First World War and was revived in 1927 by Sir Thomas Hunter, proprietor of the Perthshire Constitutional newspaper and a former Lord Provost of Perth and Member Of Parliament for the constituency. He became the first president of the new body and was later followed by his son, Col. T. Harris Hunter. Although still an all-male society, ladies were present at the prestigious annual dinners held in the Salutation Hotel and latterly the Station Hotel until 1938. The outbreak of war saw an end to the club's activities and although an unsuccessful attempt was made to revive the club in 1953, it remained in abeyance until 1977. On its re-constitution in April 1977 with Donald N. M. Paton as president, Perth Burns Club became mixed and in 1987 Ruth M. Lumsden became the first lady president. Mr Paton, along with John M. Kidd who became president of The Burns Federation in 1981, were mainly responsible for the club's second revival and both gentlemen were made Honorary Life Presidents of the club in 1979. The present membership is by no means confined to Burns enthusiasts and the monthly meetings from September to March cover many aspects of Scottish culture and entertainment. St Andrew's Day is celebrated on the last Saturday in November with an afternoon seminar and evening concert. On the first Sunday in June a coach trip is arranged to a place of Scottish historical interest. One of the objects of the club is to encourage and promote Scottish literature and music amongst the young. In November 1987, the club held its first Schools Festival in Scots solo singing, verse speaking and music for school pupils throughout Perthshire and Kinross. The success of the venture resulted in the festival becoming an annual November event. In 1990, the club was instrumental in the World Conference of The Burns Federation coming to Perth for the first time since 1926. The 3-day event attracted 550 delegates, many from overseas. The club is regularly represented at these Annual Conferences and in 1993 five members travelled to Calgary, Canada. September 2008 saw the installation of past president Bill Dawson as President of the Robert Burns World Federation, becoming the second member of the Perth club to have held this honour.